California Introduces a Homeless Bill of Rights – Direct Action Welfare Group Inc.
Building off of Rhode Island’s community effort, a coalition of West Coast organizations working with Assemblymember Tom Ammiano (D-San Francisco) introduced a Homeless Persons’ Bill of Rights and Fairness Act on December 3, 2012. In interactions with law enforcement, security guards, business owners, property managers, or BID agents. When seeking or maintaining employment. When seeking or maintaining housing or shelter. When seeking services (public benefits, medical care, help from police). In completing all necessary steps to vote. Freedom from unreasonable searches and/or seizures of personal property. Freedom to use public spaces: to move freely through them, to use them for rest, to own and possess private property in public spaces, to share, accept, and/or give food in public spaces. The right to the same protections that law enforcement agencies are supposed to afford to all other citizens, including the right to reasonable protection from domestic violence, sexual assault, hate crimes, and robberies. The right to make their own decisions regarding whether or not to enter into public or private shelters or social service programs. The right to sufficient health and hygiene centers available 24 hours including bathrooms and showers. The right to sleep, stand, sit, possess personal property, eat, or to engage in other life-sustaining activities. The right to occupy vehicles while legally parked on public property. Rights to privacy/confidentiality of housing status, poverty status, health status. The right to confidentiality of personal records regarding housing status, income level, mental illness, physical disability. The right to quality defense counsel in criminal hearings and civil warrants, when possible punishment might include jail time or commitment to a public health institution. Counties and municipalities must adhere to the Federal law so homeless children can remain in the same school that they had attended before becoming homeless or immediate enrollment in a new school. The right to restitution if the victim of a crime. The right to restitution for loss of, damage to, or destroyed property and/or personal belongings. The right to purchase goods and services. Monitor enforcement of local ordinances affecting homeless people by ensuring that information regarding the citation of homeless people by law enforcement be available to homeless people and their advocates. Right to shelter 24/7 for all people. All shelter shall be sanitary and safe. The right to safe, decent, permanent affordable housing. The right to access medical facilities and quality healthcare. The right to be provided the supplies necessary for academic success (backpacks, textbooks, notebooks, pencils, pens, and appropriate academic technology). 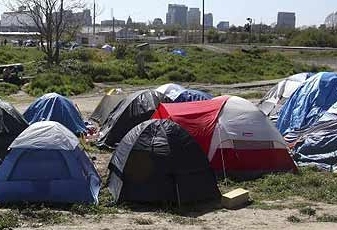 This bill creates a state standard that defines as “homeless” those who lack a fixed, regular, and adequate nighttime residence and who have a primary nighttime residence in a shelter, on the street, in a vehicle, in an enclosure or structure that is not authorized or fit for human habitation, sub-standard apartments, dwellings, doubled up temporarily, or who are staying in transitional housing programs. This includes anyone staying in residential hotels without tenancy rights, and families with children staying in residential hotels whether or not they have tenancy rights”. If you are interested in working on a Homeless Bill of Rights in West Virginia please contact DAWG. If you are interested in working on a Homeless Bill of Rights in your state you can also contact DAWG or Paul Boden of WRAP to be linked up with USACIA an international organization that is working on this among other issues of homelessness and housing.